As promised, another second helping from one of 2015’s episodes, before we get to the new stuff. 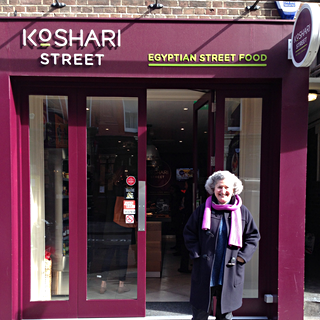 This time, I’m remembering my trip to the little place in St Martin’s Lane in London that serves a couture version of koshari, the iconic street food of Egypt. And one trouble with these second helpings is that there’s not much new to say about the topic or the episode, so I’ll just point you to the full episode from March 2015 and let you explore there. (I will also repeat the relevant show notes below). Speaking of new stuff, a couple of weeks ago, I was depressed about not being able to go to the Amsterdam Symposium on the History of Food this year. Thanks to the great generosity of a friend, I was able to go, and the first new episode of the year will be one I recorded there. There wasn’t any tulip bulb soup on offer this time, and perhaps that’s just as well.